Hi! I'm Arnie and I arrived in Colorado just a few weeks ago after I was saved at the last minute from a high-kill shelter in Texas. My foster mom says I am one of the sweetest dogs she's ever met. I like everyone - all people and dogs. I love to go for walks (I'm a perfect gentleman on leash), but I am also content snuggling up on the couch for the next Netflix binge! I am surprisingly mellow for a pup who's only about 14 months old. 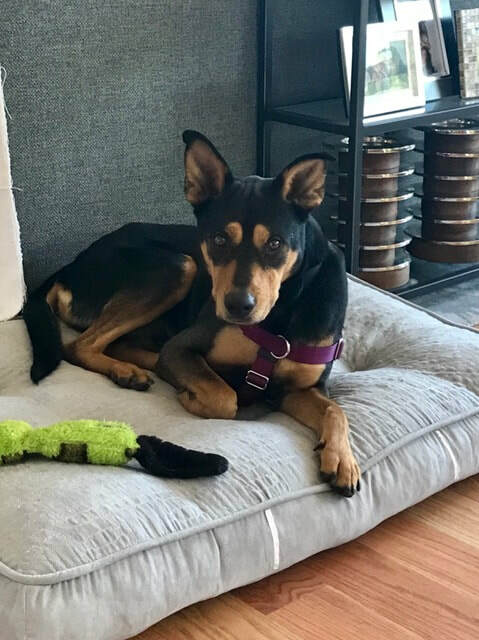 I weigh 42 pounds (I could stand to gain a little weight), and I am probably a Kelpie mix. I am almost totally housebroken (I'm a quick-learner). Everyone who meets me falls in love!